The point of the existence of different types of welding is that metals of varying sorts have very different properties. Every kind of welding is specifically designed to work for a particular group of metals. Some are great for softer metals; some work best with ferrous ones. The type of welding you will want to use as a welder also depends greatly on the size of the metal. Since welding is a process that uses very high heat, the density of a metal piece will bring important change to the welding process. If the metal piece you are working with happens to be very thin, certain types of welding will cause it to burn very easily. This is something a welder will have to avoid since the burns will leave ugly marks all over the finished product. Plus, burnt metal is not strong, so all that work will be of no use. These sorts of welding machines are usually used for inert metal gas (MIG) welding. This is a process specifically designed for mild welding. Just like the name suggests, it includes the use of a wire electrode, which is entirely consumable. For MIG welding, the base metals are melted down, so they can be joined together. Wire feed welders are best for nonferrous metals, which tend to be relatively softer. There are certain settings to these welders that you must be aware of, which depend on the types of metals and the work you are aiming to accomplish. To do wire feed welding, you will have to make sure first that you have all the equipment it requires. This includes a welding gun, welding power supply, wire feed unit, a wire electrode, and a shielding gas supply. Each part is vital to the process, and without one, MIG welding will not be possible. To work with a wire feed welding machine, you have to know exactly what kind of tools work best with it. Welding is a fairly complex technique to master, and if this type of welding is new to you, knowing some specific details will always help. To weld sheet metal, you must first decide on a suitable wire electrode diameter. This is very important, as the quality of the weld always varies according to the wire you use. Many prefer a 0.9mm wire electrode for this kind of work, but you can get wires ranging from 0.7mm to 4mm. You also must choose the perfect wire material. Most of these electrodes will have deoxidizing layers, which is a requirement for keeping the base metal protected. This also helps improve weld quality. This is a process which uses inert gases and shield. Normally, argon and carbon dioxide are used in combination to produce an optimum environment for welding to take place. For this sort of process, a higher ratio of argon is usually used. Wire feed welding calls for a good welding gun. You can buy whole sets of wire feed welders, which come with guns and a variety of wires. The “Hobart 500559 Handler 140 MIG Welder 115V” or “Lincoln Electric K2278-1 Handy Core” are some of the good ones you can go for. Set up your welder with the wire and the perfect voltage for the job to be done. For this type of welding, a constant current is normally preferred. This technique is fairly automated, so a lot of the work is cut out for you. What you need to focus on is holding the welding gun at the right angle and distance, maintaining a suitable temperature and providing the right ratio of shielding gases. Let’s specify a little on the angle and distance of your welding gun. The contact tip of the welding gun must be kept at a constant distance to the work surface. Otherwise, there could be unwanted spatter buildup or immature melting of the wire electrode. It is also important to maintain a consistent wire feed. Excessive material in one spot or too little buildup in others will result in a weaker weld and comparatively uglier look. As you move forward and weld with your gun, make sure to clean the tip of the nozzle every few minutes. Otherwise, weld could build up and potentially damage the gun. There is a welding technique you could go for, called weave welding, which is best for certain types of work. This is the best method if you want to avoid cratering or undercutting, which greatly affect weld quality. As a practiced welder, you must also remember to control the temperature by the end of the welding process to ensure that the weld solidifies perfectly on time. 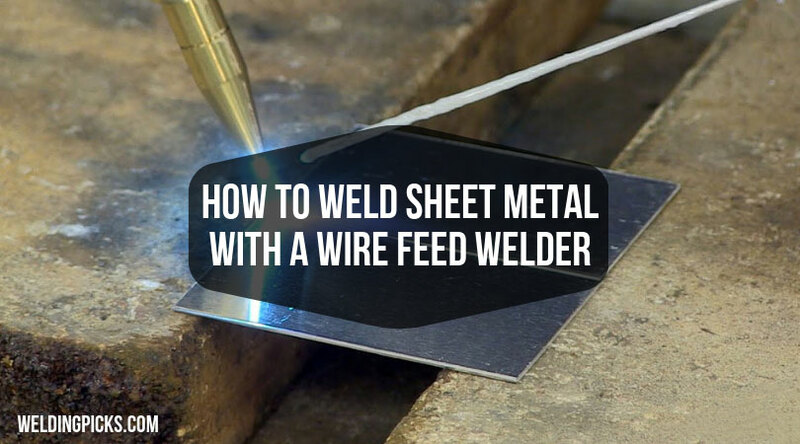 Now that you know just how to work a wire feed welder, you can get on with some lightweight metalwork that must be done. Since many types of welding only concentrate on heavy-duty, large objects like vehicles, fences, etc., it may be tough for people to find the perfect method for small jobs. This technique, as mentioned above, is great for repair work if you want to add a small piece of sheet metal to a rusted or ruined area. This is also the perfect option for beginners in the world of welding, as it is relatively a much easier process.